The Analog Signature Pack has been a best seller for Nomad Factory for years. Here is your chance to pick up the Pack or any of the individual plug-ins that make up the bundle at huge savings. Analog Signature Pack is made up of three glorious sounding analog emulations of the the classic Fairchild 660 limiter, a full range stereo EQ channel unit and a stereo channel recording plug-in bursting with warmth and colour. This offer is available until the 4th of March. 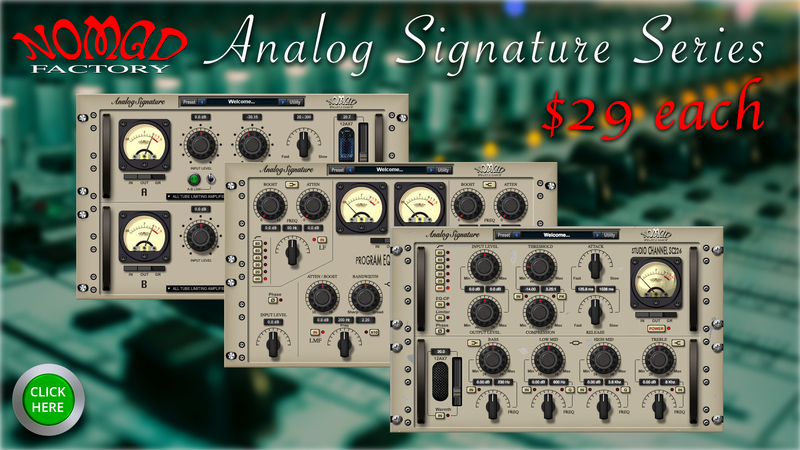 The Analog Signature Pack is available at the Promo price of $49 list $299 at the DontCrack Store. This entry was posted in Audio Software, DontCrack, Plug-ins, Promotions and tagged Analog Signature Pack, analog warming, Channel Strip, Equaliser, Limiter, Limiting Amplifier LM-662, Nomad Factory, Program Equalizer EQP-4, Studio Channel SC-226. Bookmark the permalink.